Guys, it’s cold today. Like space-heater-in-the-bathroom kind of cold. It’s also been almost TWO MONTHS since we tied the knot and went on our amazing honeymoon, so it’s time to relive some of those memories. 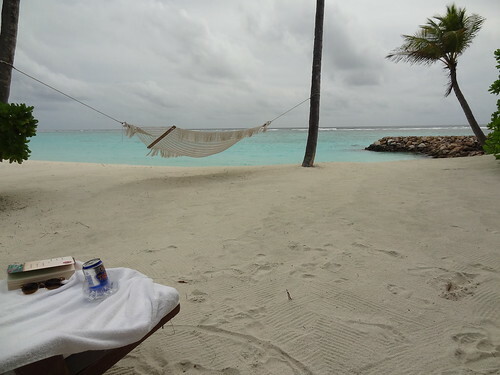 Last month I previewed our trip put together by Lynn at Bella Vacations, but the Maldives offered so much more. Before I pile on the photos, a word about the location. If you’ve ever considered vacationing in the Maldives, which is made of a chain of thousands of teeny little islands off the south west coast of India, you know how difficult it is to choose among the many many many resorts. Each island is one, in fact. My head was spinning round and round on Trip Advisor and travel blogs as they all looked amazing. Truly paradise. Fortunately Lynn helped narrow the field and shifted my focus to the One & Only Reethi Rah. We got a great vacation package and the complicated decision was made very simple. 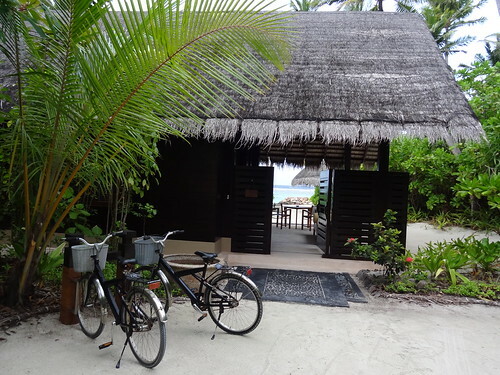 Many Maldivian resorts are tiny. Like 10 – 30 villas/huts/whatever tiny. That also means that there are likely to be fewer food choices. 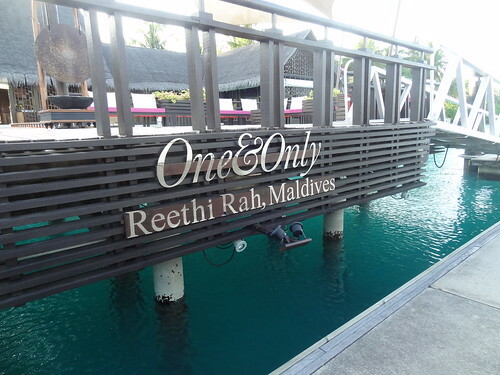 Being stranded in the middle of the Indian Ocean with only one restaurant that may be underwhelming weighed heavily on my mind, and we went whole-heartedly after the Reethi Rah, which boasts 4 separate restaurants + three more options for lunch. So grab your hot chocolate, imagine it’s a coconut mocha, and enjoy the splendor that was the One & Only Reethi Rah, Maldives. Welcome! Reethi Rah translates to Beautiful Life, which indeed it is on this gorgeous island. The accommodations were extremely generous and secluded, although we had to move from our original room that was located next to the main restaurant. This was our villa for most of the week on the sunset side of the island. We had beach cruisers to make our way around the island on our own terms. Perfect mode of transportation! This was our back yard after transferring rooms. It was pretty overcast this day, but the sun still beat through being at the equator. I spent many hours reading and knitting on our loungers listening to the surf and wind. Aaaaahhhhh take me back! It’s been a month since my last post and a LOT has happened. Like, I’m finally a Mrs. and we just got home yesterday from a super amazing honeymoon. I went to bed around 9:30 last night and made it to 5 AM today. Let me tell you, it was quite a shock to wake up without the sound of waves crashing, missing my in-room Nespresso machine and the amazing ocean-side breakfast service. But alas, one must return to reality I suppose. As for the wedding, I don’t have the professional photos yet but I can assure you the day was absolutely gorgeous if I may say so myself. The weather was perfect. The food was amazing – from the oyster bar featuring local goods to the barbecue dinner and assorted mini pies and cupcakes for dessert. Guests had a blast. We executed our first dance like pros and had an amazing time together. I’ll post more on the details once I have photos to share. Our honeymoon was planned by Lynn at Bella Vacations and we seriously could not have dreamed of a better trip to Dubai and the Maldives. The experiences were out of this world and the food was top notch at every turn. Each property was also prepared with special “Honeymoon” treats – hard to decide which had the better chocolates, towel swans and other touches. What do you think?